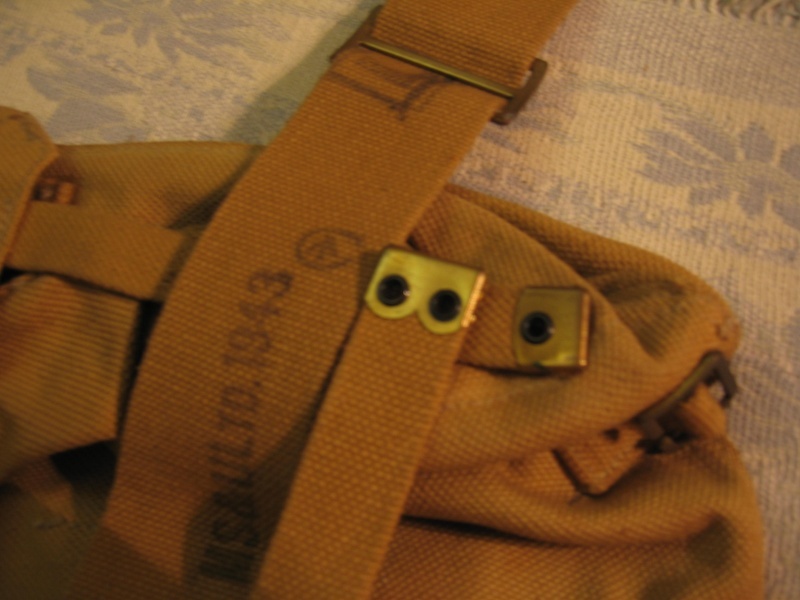 • In 1940, buckles were added to the side of the binocular case. 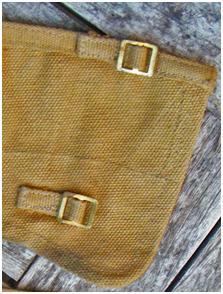 • In 1941, basic pouch closure tabs were widened from ¾” to 1”. 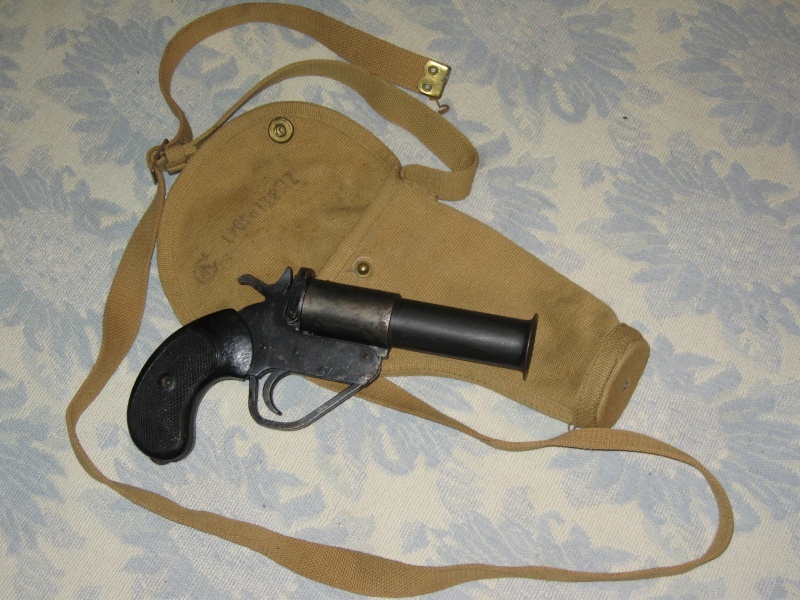 • In 1942, a larger webbing holster was created for large frame revolvers. 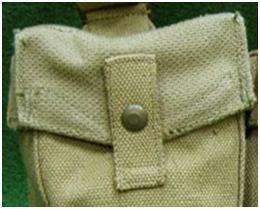 • In 1942, the water bottle carrier switched from a top-opening stud to a front stud. 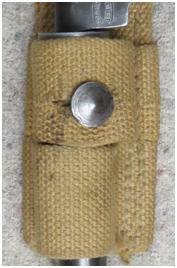 • In 1942, a smaller frog appeared specifically designed for the spike bayonet. 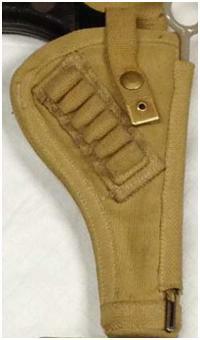 • In 1942, the braces were switched from a one-piece construction to multiple pieces (Z.L.&T.LTD. only). • In 1942, snaps became smooth rather than pebble-grained. 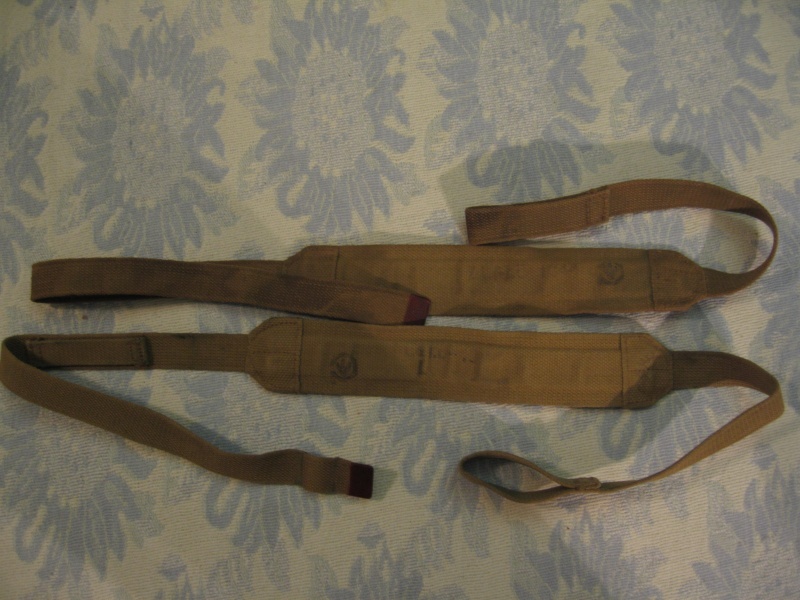 • Starting in 1942 or 1943, the upper loop of frogs were split and stitched to fit the new spike bayonet (though earlier dated frogs were retrofitted with modified upper loops as well). 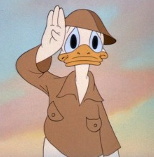 • Starting in 1943, brass components were replaced with brown phosphate-finished metal known as "battle brass". 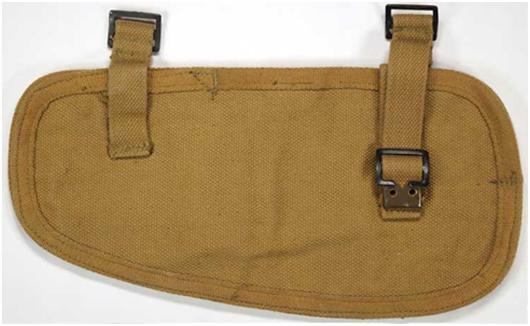 • Starting in 1943, Zephyr Loom & Textile Limited began to intermittently use blackened steel fittings on rifle slings, entrenching tool carriers and L-straps. 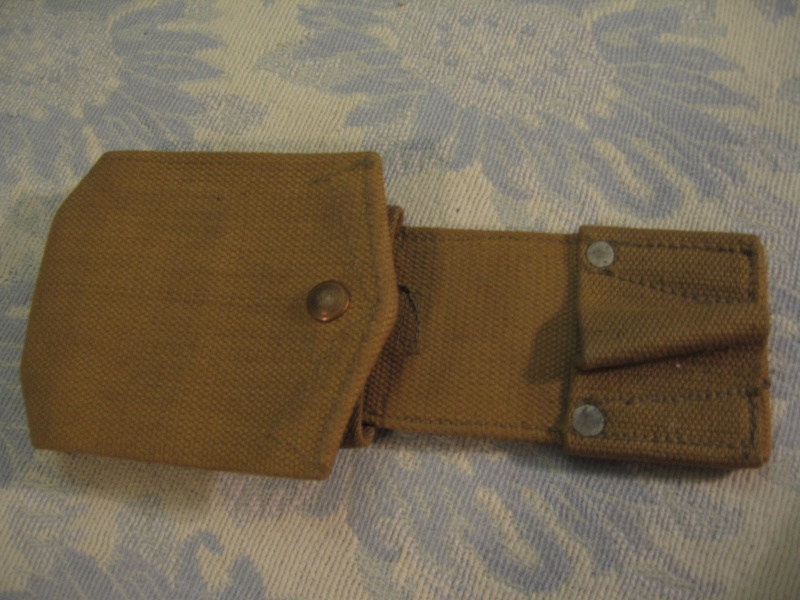 • In 1943, the basic pouch buckle became flat pressed rather than curved. 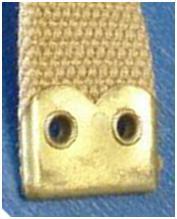 • In 1943, the brace adaptors switched from a movable center bar to a solid center bar. 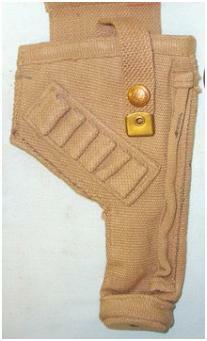 • Starting in 1942-1943, a cloth rim was included on gaiters, entrenching tool cover, and tanker holster. 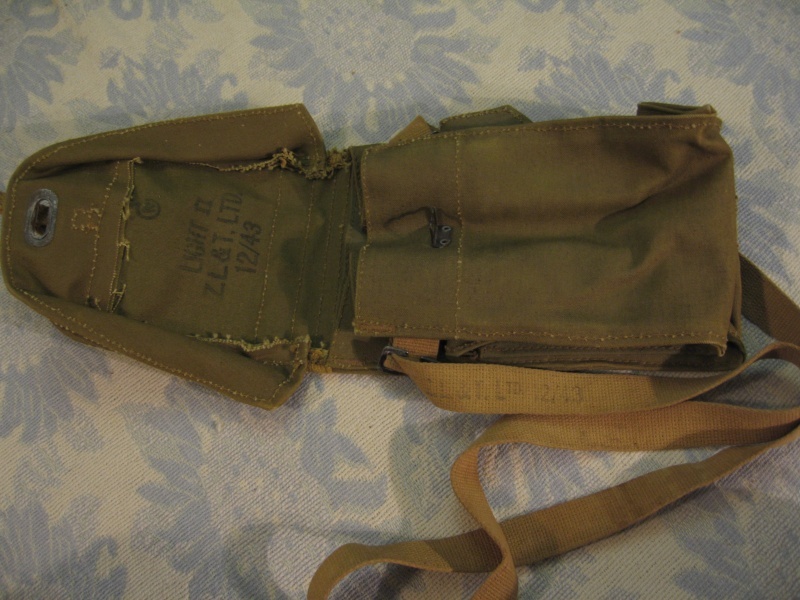 • In 1943, the L-straps (made by Z.L.&T. 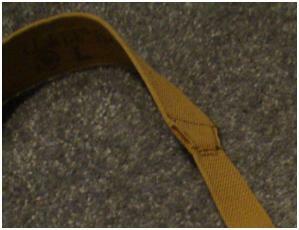 LTD.) switched to a 2” strap with no 1” reduction. 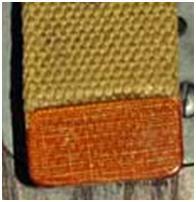 • In late 1943, brace ends switched from eyeleted tips to phenolic resin impregnated tips. *I do not have any rights to the above pictures, they are used merely for reference purposes. Very informative. Thanks for posting. Mike. Thanks for taking a look Mike! I hope this will be a useful guide for identifying and dating Canadian webbing that has lost its markings or been blancoed. Very interesting and informative write up. Most of what you wrote I agree with and apply to most webbing but there are always exceptions. I do not claim to be an expert and there is a lot for me to still learn. 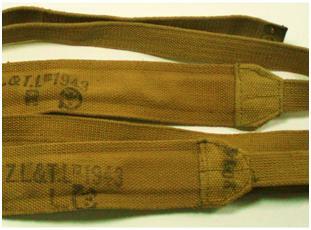 Having said that over the last decade or so I have tried to collect all WWII Canadian webbing I could find. Collecting an example of every maker and date for a specific piece. 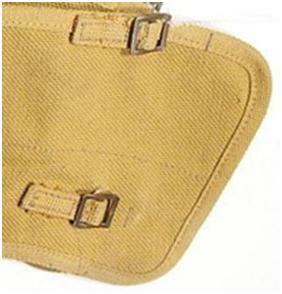 What I noticed off hand while looking over your pictures is the binocular case strap buckle is not correct. I have a mint unissued 1940 dated Z.L.&T. 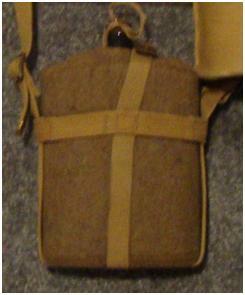 binocular case with side buckles. 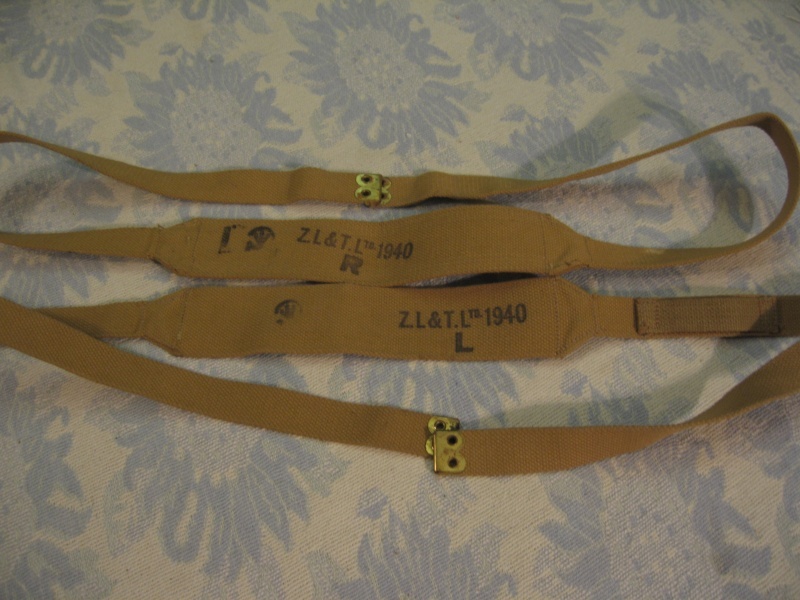 Also regarding L-Straps, I have only been able to find Z.L.&T. 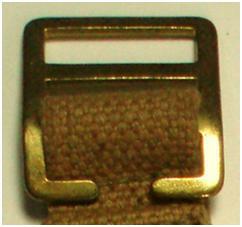 L Straps that do not taper. All of my M.S.&U. 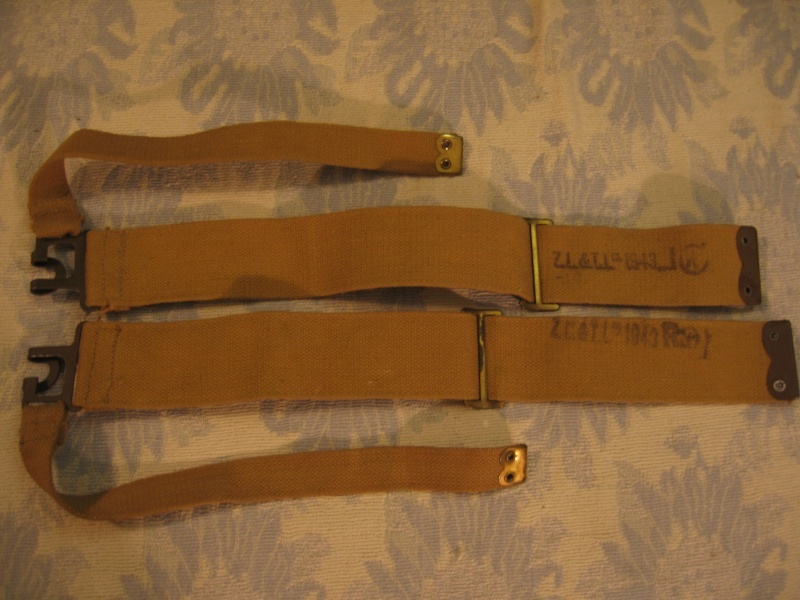 L-Straps of all dates do not taper. 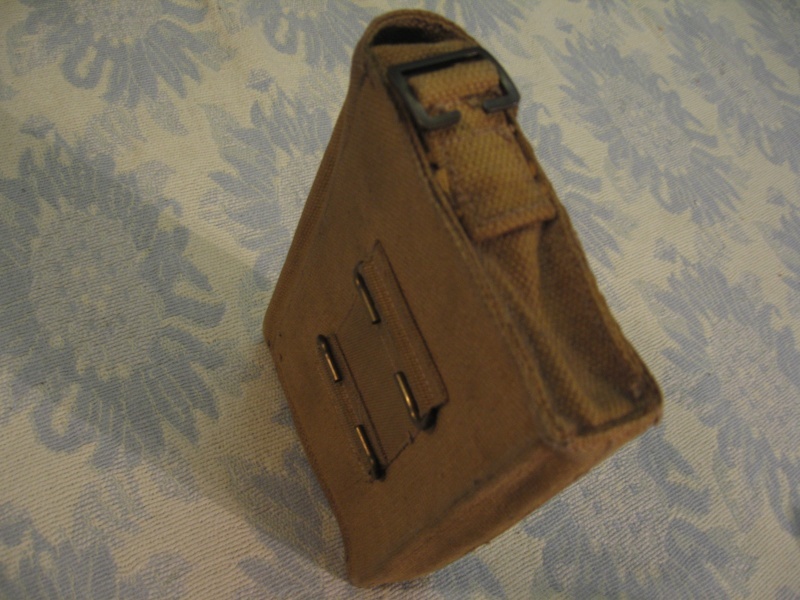 Thanks for the input, I just updated the date of the binocular case modification! I compiled this list over the years from personal observations, so any additional information is greatly appreciated and beneficial for everyone! 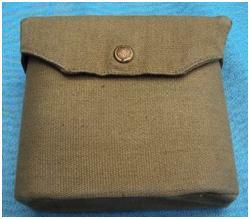 According to Karkee web in regards to binocular cases, "...A.C.I. 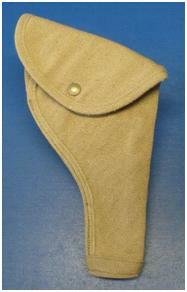 580/1941 provided for a modification to existing Cases, with new production being made to the modified standard." 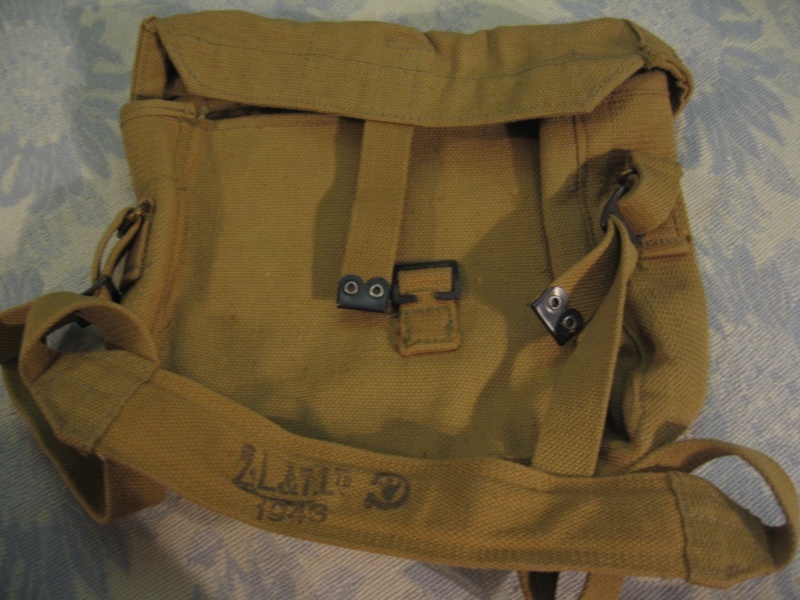 Do the buckles on your 1940 case look like they were added later by any chance? 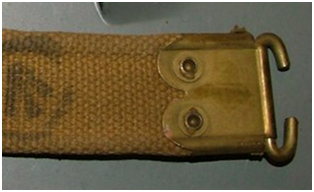 I have had a hard time determining when the top loop of the Canadian bayonet frog was split to allow carriage of the spike bayonet scabbard. 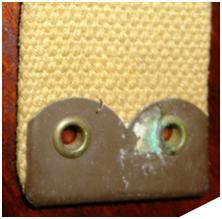 I have a 1941-dated example, but the top loop looks like it was restitched. Perhaps this was a later alteration that modified early stock as well? Lastly, could you clarify your statement about l-straps? A couple of images and a potential source. Here is a reference source. Thanks for the close-ups Ed! 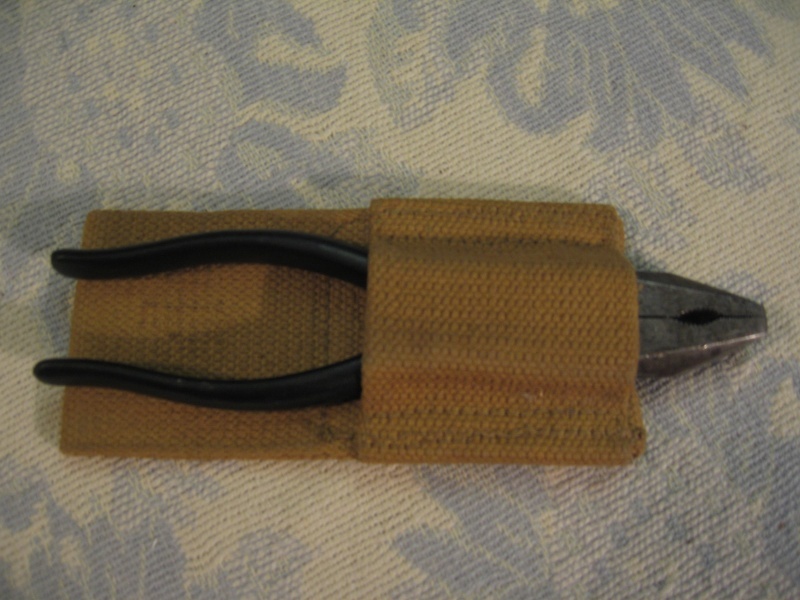 Do you know what year they started modifying the upper loop of the bayonet frog by any chance? 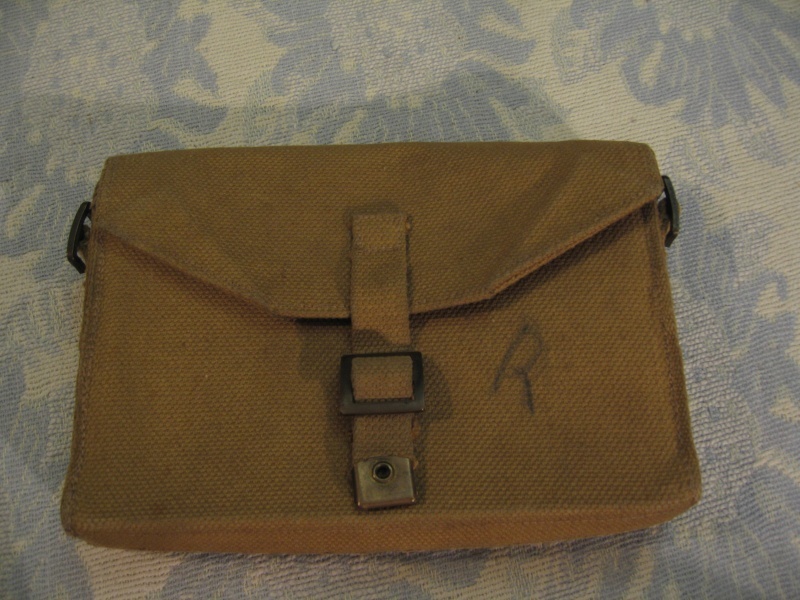 My 1940 Canadian dated binocular case are factory original side strap buckles. The bayonet frog is a hard one to date the change over to the accept the spike. I have a few examples with different dates some look orginal and some look modified after original production. 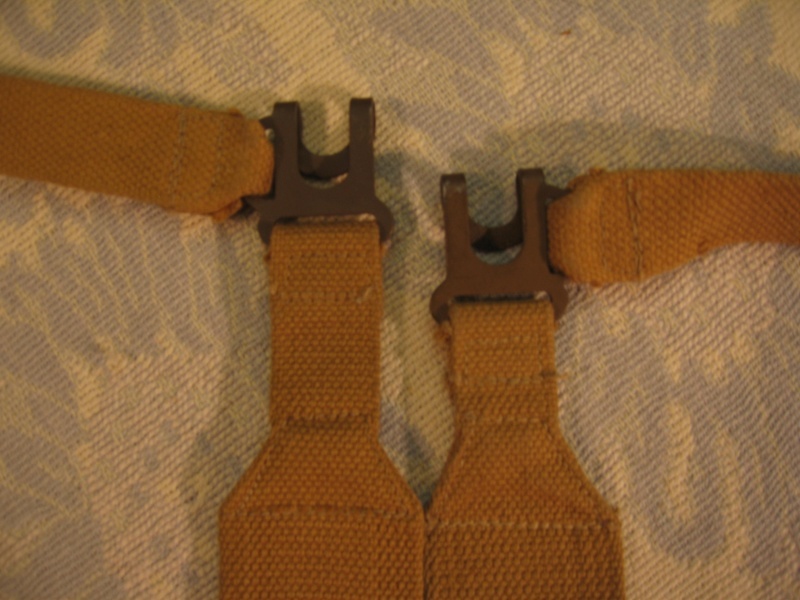 The L-Strap tapering at the 90 degree I was reffering to is the one you have you have pictured with the brown metal fittings on the right. I have only seen Z.L.&T. examples that have that starting in 1943. All of my M.S.&U. 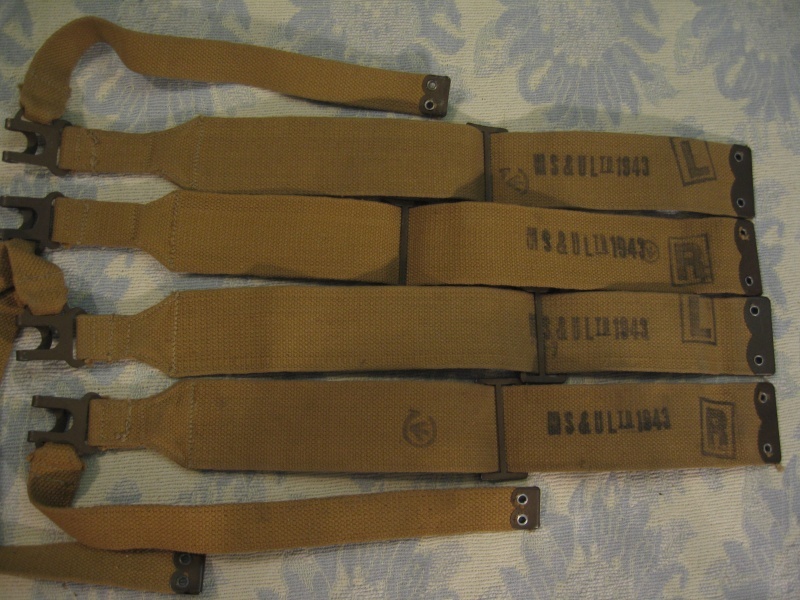 L-straps dated 1943 do not have that variation and continued to use the stardard form of manufacturing. 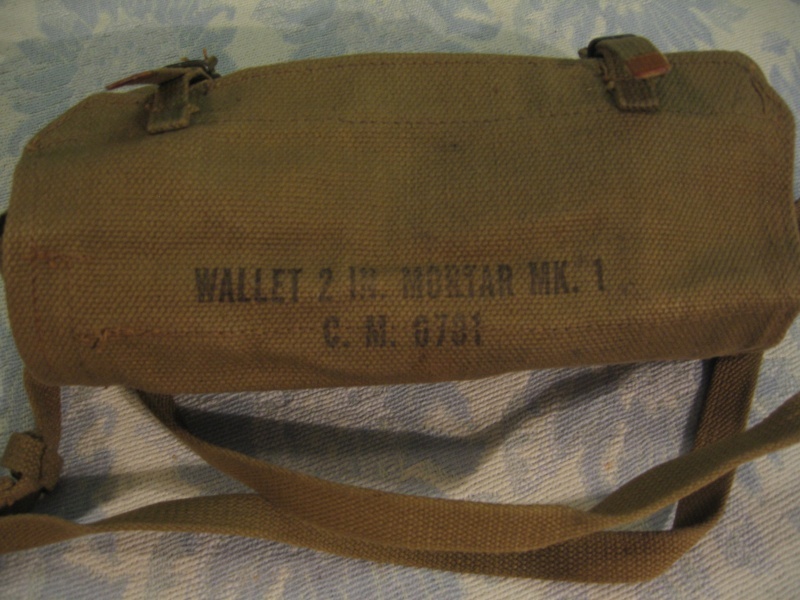 ED, are both binocular cases you posted 1940 dated? 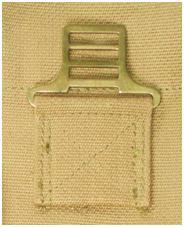 I just updated the L strap entry in light of your information. Do you know what form 1944-45 M.S.&U./Z.L.&T. L-straps took? 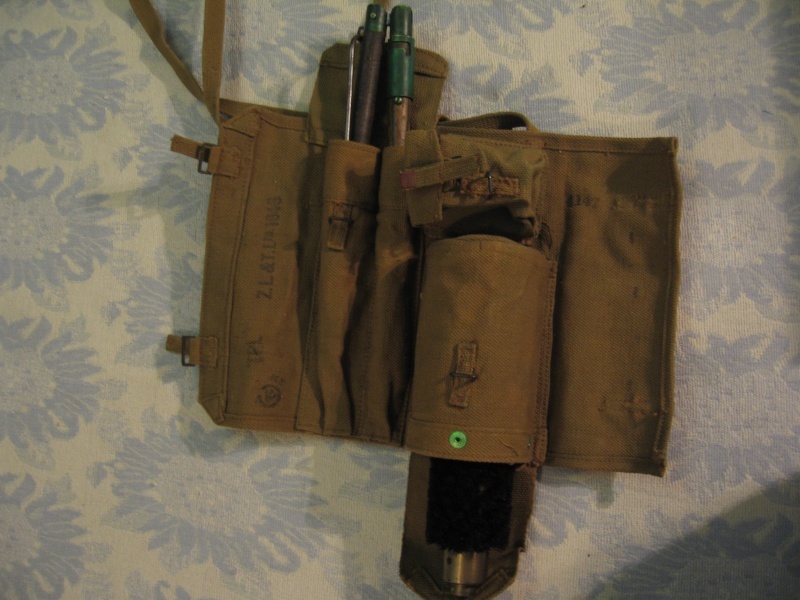 Also, since I have seen 1942 Canadian bayonet frogs without the modified upper loop, I imagine the alteration occurred sometime in 1942-1943. 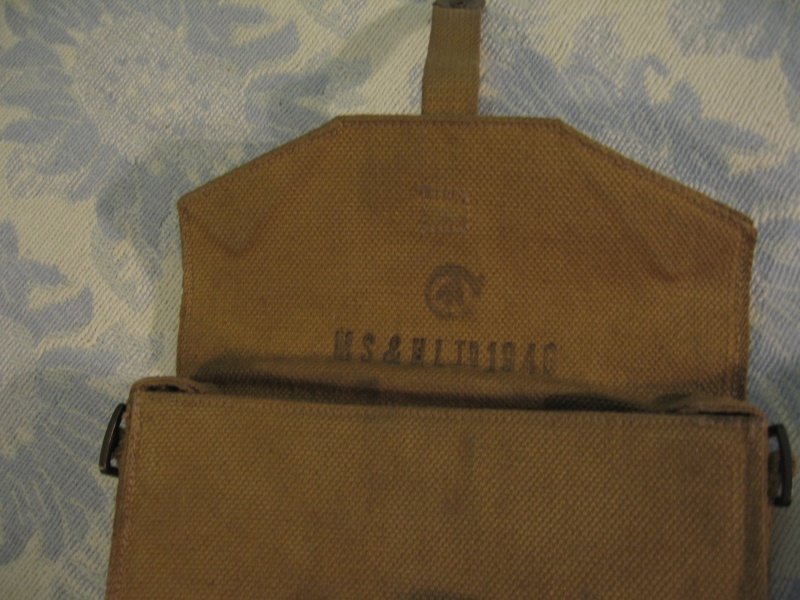 Lastly, would you mind posting a photo of your 1940 binocular case with side buckles? It sounds very interesting! From what I see M.S.&U./Z.L.&T. 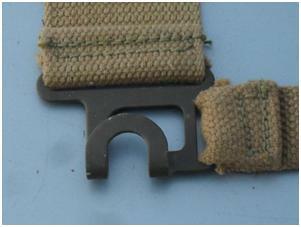 geared down production on some of the basic webbing near the end of the war. 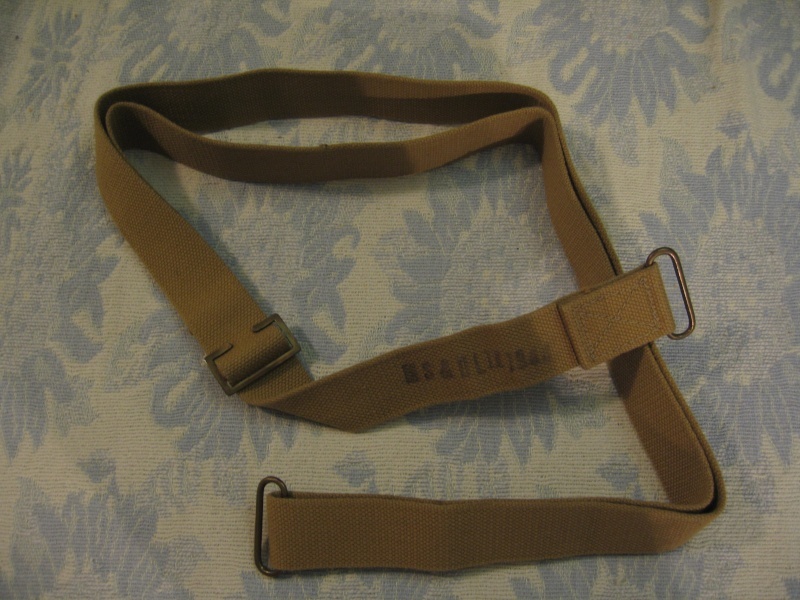 I have not actually ever seen a 1944-45 dated Canadian L-strap for sale or refferenced in a book. might be some out there but for sure they would be rare if they do exist. 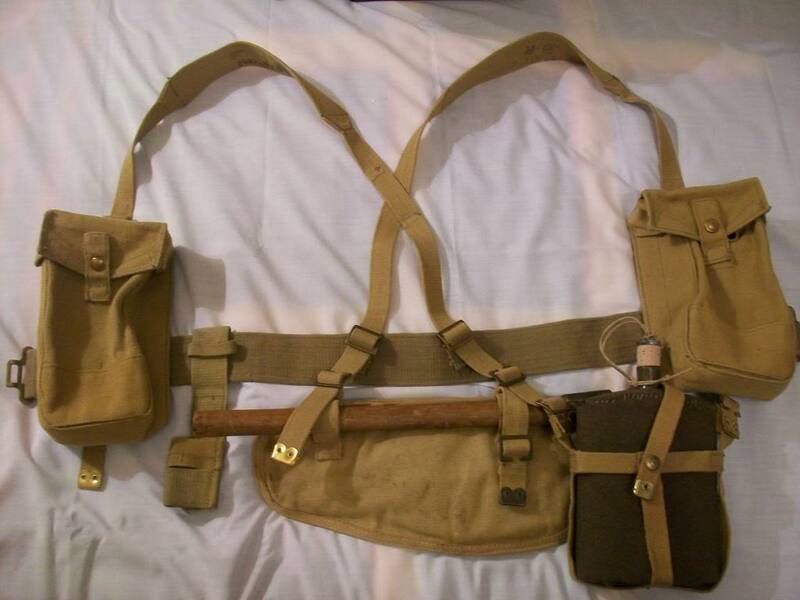 From what I have read stock piles had been built up of regular webbing all over the common wealth (I still am uncovering cases of unissued WWII Can/Brit small packs, large packs,L-straps, braces ect.) and production moved to new web requirements for new issued or modified equipment. i.e. 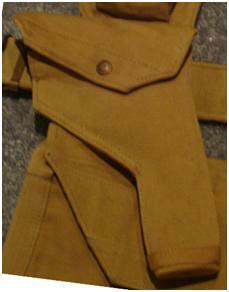 Inglis holsters, light resperator bags and so on. I think you are correct about the frogs, modifications could have still even been done right up to 1945 as some home guard units or Indian army were still being issued Mk I Lee Enfields and sword bayonets. I would love to post pictures on my binocular case and would have already but I have not figured out how to post on this site and have given up long ago. 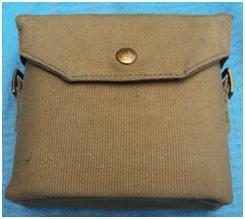 Here is an interesting attachment for early Binocular Cases. Thanks for the additional pictures Ed! 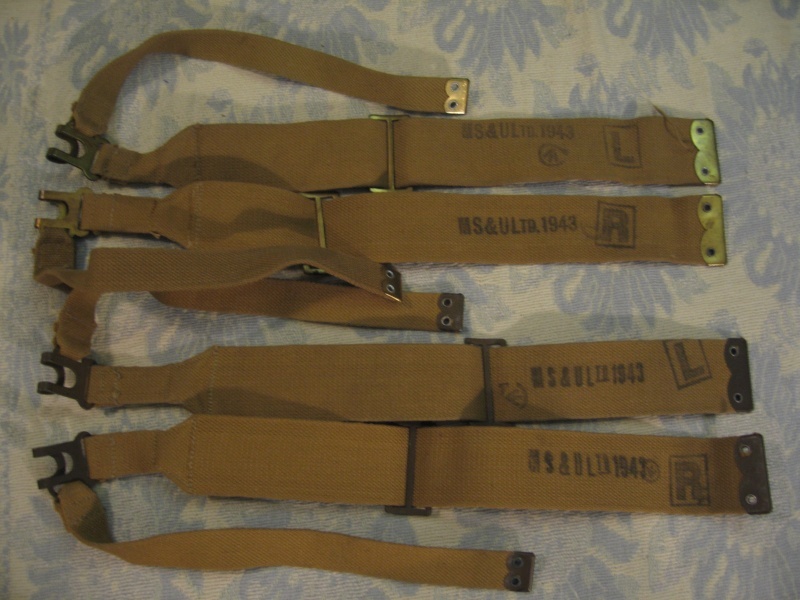 Thanks for the info on the L-straps! It's amazing where Canadian webbing ended up around the world! Australia, New Zealand and South Africa for a start. 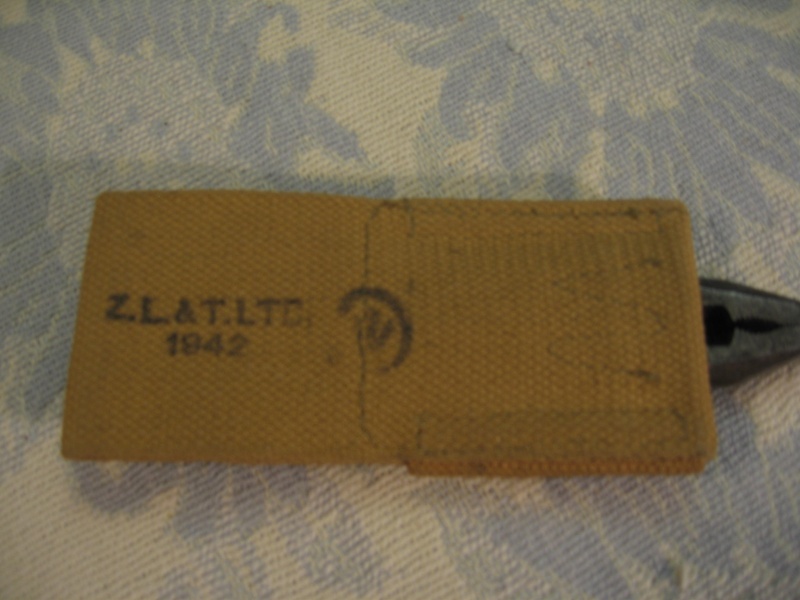 I recently ordered a p37 web belt from South Africa and was very surprised to find it stamped "Z.L.&T.LTD. 1941"! 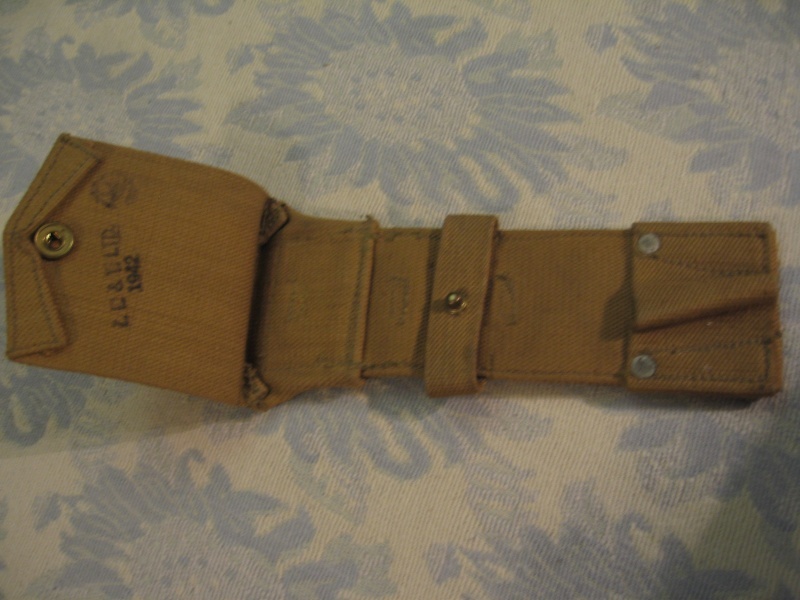 Even after Canada was done supplying the South Africans with webbing early in the war, they continued to send snaps for South African webbing (which are all marked United Carr - Canada). 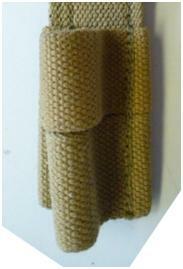 Since South African webbing is rarely dated, I imagine the pieces with pebble-grain snaps are 1942 or earlier. To post a picture simply click the "host an image" button, then browse/select the appropriate pictures file and hit the "host it" button. A box with three URL's will appear, copy the middle URL and paste it where you want the picture to appear in the text. This is a great thread, a lot of great info. I'm curious Ed, is that bino case career a Britsh or Canadian example? 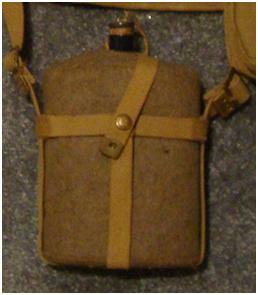 Here is a photo of 48th's 1940-dated binocular case with side buckles. If the buckles were added at some later date, they sure did an excellent job of it! 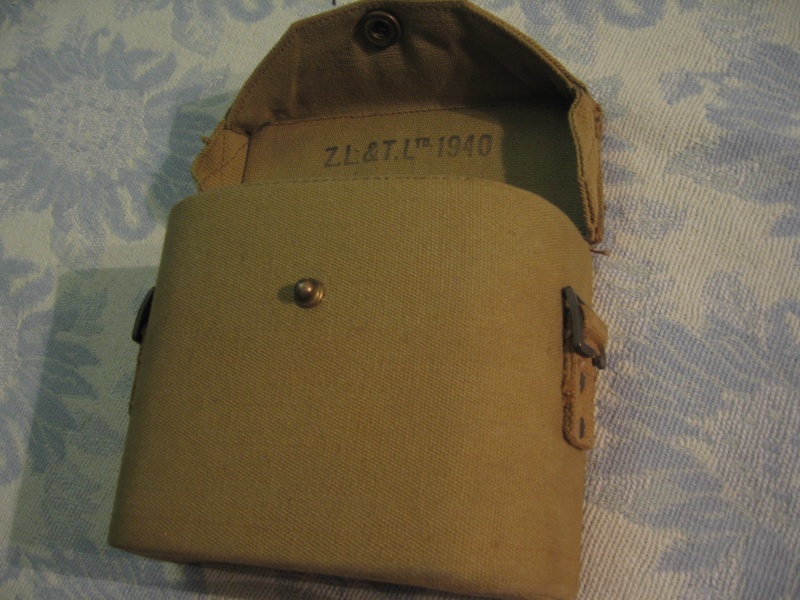 I have an example of a 1940 bino case made by Z.L&T without buckles, but I have also seen them with. Also all the examples that i've seen appeared to be factory done rathee than modifications. The frog on the left is marked "Z.L.&T. 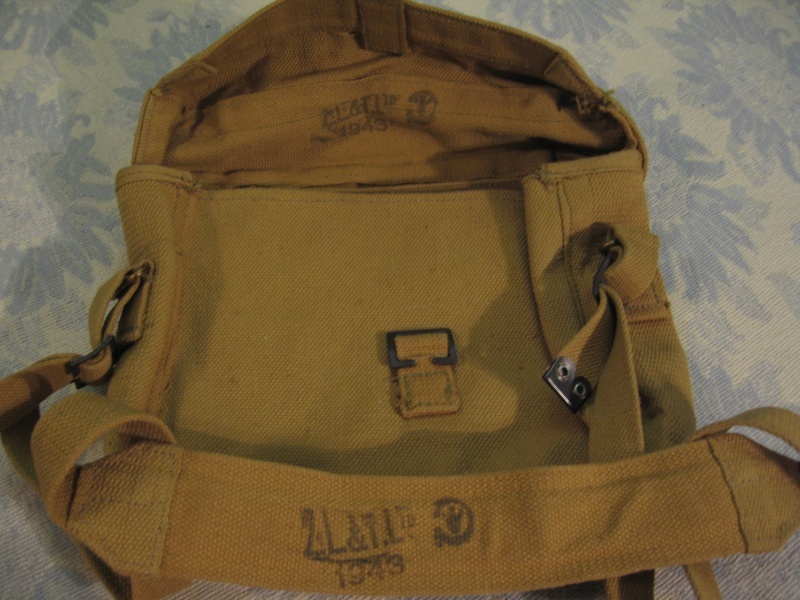 Ltd. 1942" and demonstrates that unmodified frogs were produced into 1942. 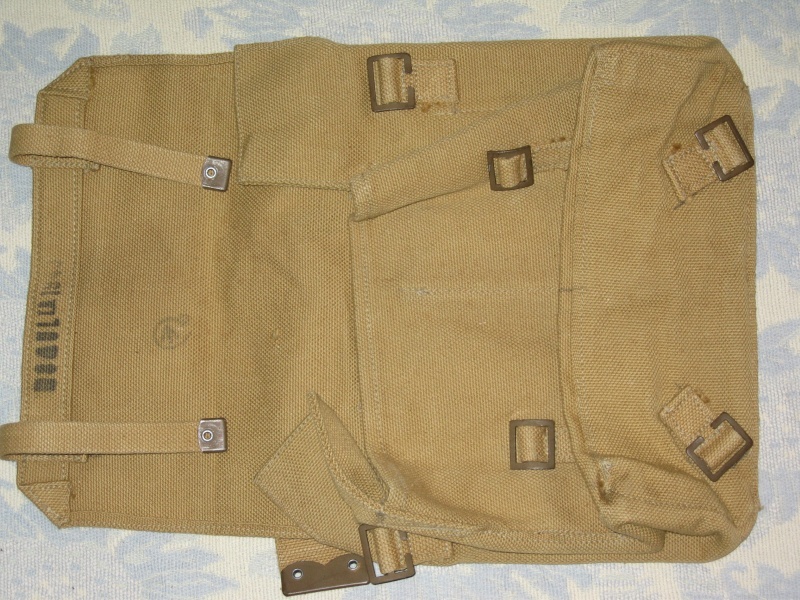 The modified middle frog is marked "GEW 1943" and is a uniform shade of khaki throughout. The frog on the right appears to be very faintly marked "M.S.&U.Ltd. 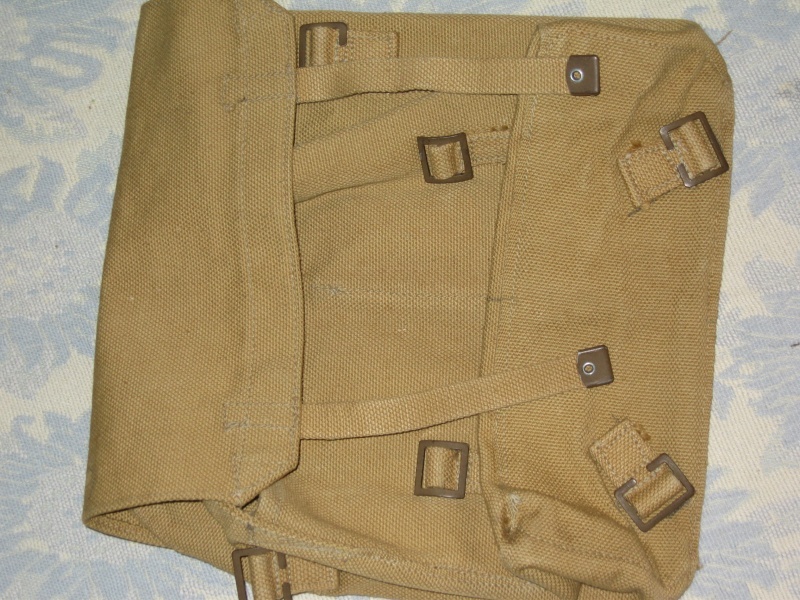 1941" and has a split upper loop in a noticeably different shade of khaki. 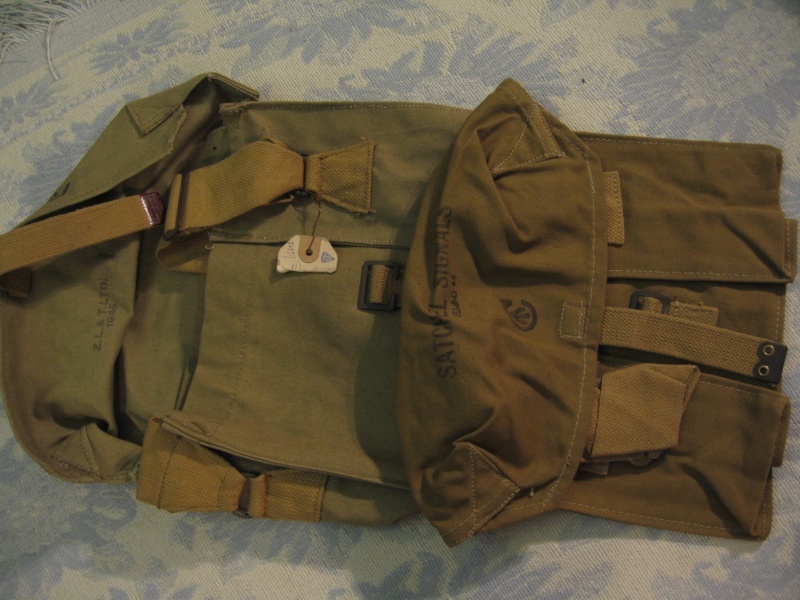 The frog below is marked "GEW 1941" and also has an upper split loop in a different shade of khaki (difficult to see in these pictures). 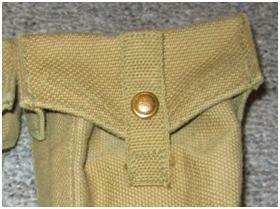 The close up shot reveals that the stitching of the upper loop is a different shade and pattern than the rest of the frog and indicates alteration. I think its time to jump start this thread, some really good info and pics were starting to come out. 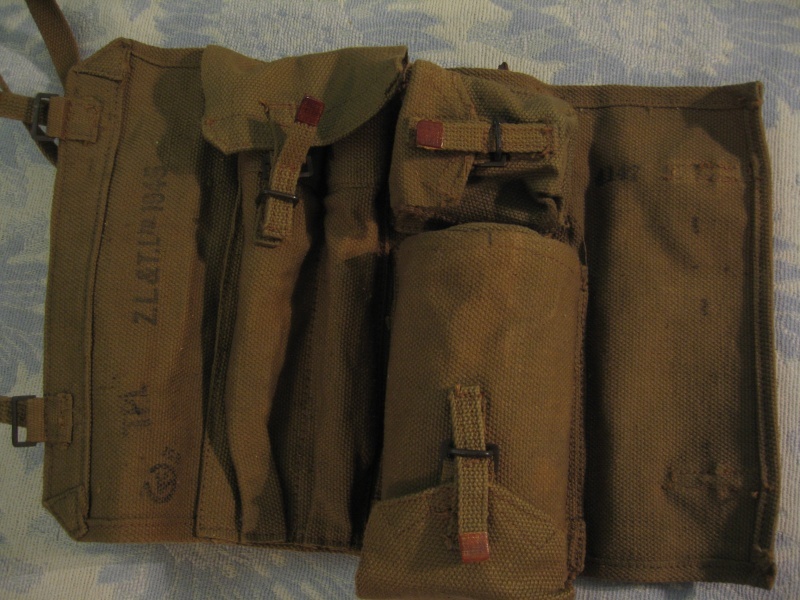 Heres a basic set of P37 webbing from my collection. 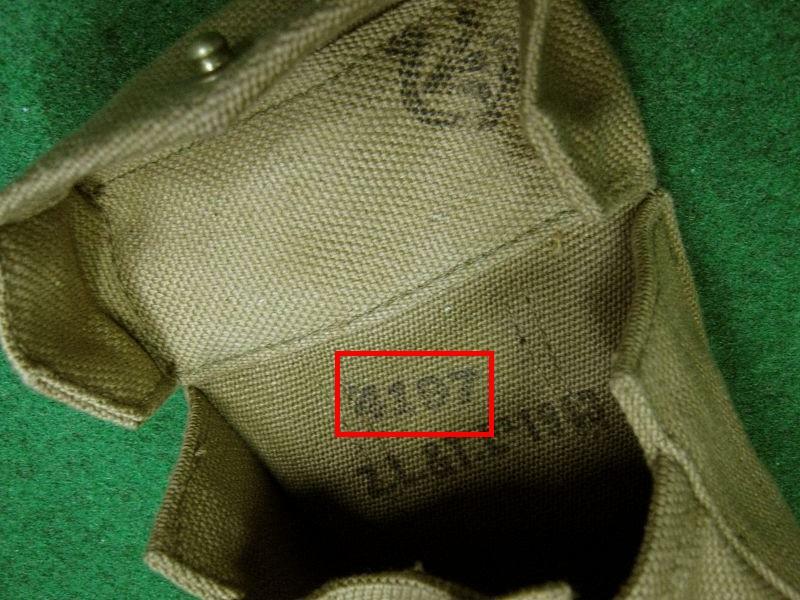 Does anybody know if the 4 digit codes (see below) that frequently appear on Canadian webbing are inspector marks? Wow!!! Those are some of the best quality stamped maker's marks I've seen. 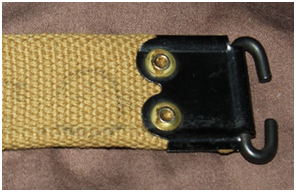 It's not common to find webbing/canvas items with such crisp, dark stampings. Thanks for sharing.